Every so often you get an app that doesn’t work properly, crashes, freezes, or otherwise messes up your iPhone. When this happens, you can report the problem directly from your iPhone, so that Apple and the developer know of the problem and (hopefully) can fix it. Tap the App Store icon to launch the App Store. Navigate to the detail screen for the app. Scroll down the page to the Reviews item and tap it. From the Reviews screen, tap the New Document icon. Tap the Report a Problem button. You may or may not have to type your iTunes store password at this point. Tap one of the three buttons to identify the type of problem you’re reporting: This application has a bug; This application is offensive; or My concern is not listed here. Type your report in the Comments field. 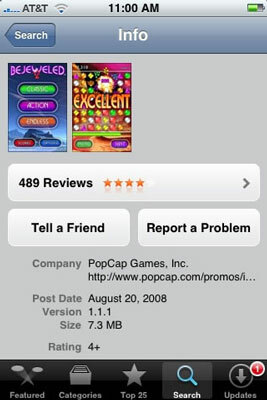 Tap the Report button in the upper-right corner of the screen to submit the report.